The construction of the Winchester Cathedral began in 1079, on the same site where once stood an even older Saxon church. 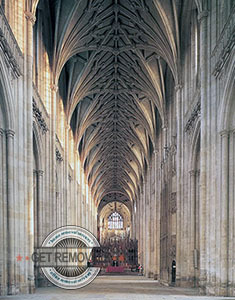 Today the Winchester Cathedral is the world’s longest cathedral with a length of 526 feet and its towering 12-bay nave. The cathedral is situated in the heart of the city of Winchester which many still described as a market town. The city is even older than the cathedral and at one point in time was the capital city of the Anglo-Saxon Kingdom of Wessex and the seat of the legendary King Alfred the Great. During the 9th century, the city of Winchester was one of England’s most important political, religious and commerce centres. The Winchester Cathedral isn’t the only famed landmark of the city. The Great Hall is another local landmark that attracts both local and foreign visitors by the number. The main feature of the Great Hall is King Arthur’s iconic and mythical Round Table. But enough about the city and let us turn our attention back towards the cathedral. The interior of the cathedral is as formidable as its exterior. Perhaps the most impressive feature of the Winchester Cathedral is its 15th century ornate stone high Altar. Another interesting feature of the cathedral is the tomb of renowned English novelist Jane Austen. The tomb is situated in one quite corner of the church. Even more visitors of the cathedral can visit the Jane Austen’s House Museum once they are done with the touring of the cathedral. The museum lies in the village of Chawton and is house in Chawton Cottage which was the country home of the novelist. The Winchester Cathedral is also the final resting place of several other notable people such as Walkelin who was the first Norman Bishop of Winchester, Henry Beaufort who was the Cardinal and Bishop of Winchester, author Izaak Walton, Peter des Roches Bishop of Winchester and many, many more. The cathedral possesses the only diatonic ring of church bells in the world. The bells are 14 in total and the largest (tenor) bell weights the staggering 1.8 tonnes. The city of Winchester is also known for its picturesque green landscapes, so visitors can take their time and wander through the streets of the city when they are done touring the cathedral. The city is home to several top notch accommodation establishments the most famed of which is the Lainston House Hotel, a stately home which dates back to the late 17th century. You can comfortable say that the Winchester Cathedral is a must see site in England. So you can decide to make the trip to the city of Winchester once your removal is over and you and your family have settled in. Know that removal services are provide at cost effective prices in present time so don’t be hesitate to use such services if you are relocation from one place to another. All the more you don’t need a reason to visit the welcoming city of Winchester. While you are in Winchester don’t forget to pass by the City Museum, as it is another local landmark worth a visit.